Hi Microbz family, this week we are talking with Holly Johnson from Holly’s Wholesome Kitchen. 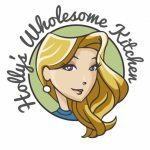 Holly is a promoter of all things healthy and her website is the perfect platform promoting delicious recipes, reviews on new health products and tips on nourishing your wellbeing. As well as her website, you can find Holly’s mouth-watering recipes in the Vegan Food & Living Magazine and local press. We are going to be quizzing Holly on her recipe inspiration, advice for maintaining a healthy diet and of course, the all-important topic of gut health! Q1) How did Holly’s Wholesome Kitchen first originate – what was your driving force behind establishing it? health and re-build from there. I’ve always eaten healthily but this particular part of the journey guided me to look further into how what we nourish our bodies with can impact our overall health and wellbeing. 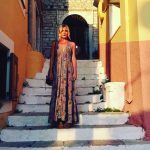 I discovered an amazing nutritional therapist who also practices Kineasiology and with a concoction of nutritional supplements and a deeper understanding of the importance of a balance diet, I began to feel better each day. Creating delicious and nutritious smoothies each day took my mind off the pain and it gave me a focus, something exciting and creative to channel my energy in to. When the layers of skin came off my face to reveal new, healthy, glowing skin, I realised then that I wanted to help other people who may be going through similar. I wrote a blog titled ‘The Skin I’m In” which documents this process and how I ate my way back to optimum health. Although this particular time in my life was painful and it tested me to my limit, I am very grateful to have had the opportunity to go through it. I feel that this is what drives my passion for creating healthy recipes and I get a great sense of joy and fulfilment from helping people. Taking the positive from a negative situation was a cathartic process for me and now I am doing something that I absolutely love! Q2) What prompted you to explore the gut microbiome and the importance of how gut health is connected to our overall wellbeing? Prior to seeking the expertise of a nutritional therapist, I hadn’t heard of the the gut microbiome and how for optimum health to be achieved and maintained, it’s crucial to keep it harmoniously-balanced. Once i’d started reading about ‘Leaky Gut Sydrome’, it opened-up a whole new world! I then discovered something called the gut-brain axis – there has been lots of research into how the microbiome ‘speaks’ to the brain and when the meadow of the gut is flourishing, this two-way exchange of information becomes a reflection of this. I became fascinated by the link between mental health and the gut and ever since, i’ve been reading-up and researching the subject; the consequence of which is that all of my recipes are now based upon ways to fortify and bolster the gut. I am a firm believer, having lived it first-hand that a strong and healthy gut equates to a strong and healthy mind. Q3) What would you say is a “good diet”? We all love to indulge once in a while, how strict do you feel people have to be when trying to eat well? In my eyes, a ‘good’ diet contains a balanced variety of foods that are not pre-packaged, full of preservatives or loaded with refined sugar. I think that it’s important to listen to our bodies and eat natural, seasonal fruit and vegetables whenever possible. Eating with the seasons is a very important part of my routine; making the most of what Mother Nature provides in its purest form (i.e. raw) is the key to unlocking its goodness and potency. However. I just LOVE a bit of cake and I think that it’s so important to eat a little of what you fancy sometimes otherwise life would be boring! I like to use gluten-free alternatives in my recipes and I love to experiment with new flavours and ingredients. I think that if we are too strict with what we eat, food loses its joy! It’s all about balance, as is life, and if we can maintain a healthy balance with what we eat, we will feel healthy and glow from the inside! Q4) What are the consequences of not following a wholesome diet? I believe that we instinctively know what our bodies require to achieve optimum health. If we eat lots of wholesome foods, we will certainly feel better. Foods high in sugar, salt and saturated fats can have a detrimental impact on our health and can lead to various diseases. If we are really in-tune with our bodies and keep things balanced, we will ultimately pave the way for vibrant, sparkling health and wellbeing. Q5) What is your favourite recipe this Autumn and where do you find your inspiration? Ooo! 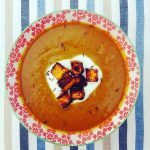 That’s a tough one as I adore all of the beautiful, earthy vegetables we are surrounded by in Autumn but I would have to go for my spiced butternut squash soup with sweet potato croutons. When I get it just right, it’s so deliciously creamy and I can feel the goodness in every mouthful! I like to top it with a good dollop of dairy-free yogurt to make it extra luscious and a sprinkling of toasted cumin seeds adds the finishing touch. Aromatic spices are really good for us and the addition or turmeric gives this recipe an extra anti-inflammatory kick (great for gut health). I find inspiration everywhere I go. The other day, I came across a beautiful tree with burgundy leaves which was set against a lush, green lawn. This gave rise to my minted pea and mint soup with beetroot chips! I love creating colourful, vibrant food and the hues of the seasons are most definitely my biggest influence. I also love to visit my local health store – there’s always something new to try and a lot of the time, I pick-up a ingredients and just make something completely new; i’m loving fresh turmeric root in my juices at the moment. Q6) We see you’ve recently launched your “Nourish Me Wellness Box” – what is the idea behind them and what sort of goodies can we expect to find inside? My NourishMe Wellness Box was a really happy accident. Over the past few months, I have been lucky enough to try lots of exciting new health food products and alongside this, I have been creating lots of art. Whilst chanting one morning (i’ve been practicing Nichiren Buddhism for 8 years), the word ‘NourishMe’ came to mind and I thought that a box full of goodies to nourish the mind as well as the body would be a great thing to create. It’s a great platform to showcase all of the various products i’ve discovered whilst adding my own extra touch of quotes, artwork and a handmade piece of jewellery. The contents of the box will be different each month but all of the snacks will be vegan, gluten, dairy and refined sugar free. My main aim for my boxes is to share positivity, good vibes and a lot of love! Q7) What daily rituals would you recommend for people who would like to boost their gut health and do you have any go to foods for when you are feeling sluggish and your gut is out of sorts? I think that it’s really important to stay hydrated – a well-hydrated gut is essential for eliminating toxins and hormones from the body and it also helps to keep energy flowing. I feel much better in myself if I am consistent with my water intake. If I am feeling sluggish, I try to eat more raw fruits and vegetables; friendly bacteria in the gut thrive on fibre. I also like to take a probiotic supplement; supplements are amazing at nourishing the good guys in the gut which in turn leads to a balanced and healthy microbiome. I am so happy to have discovered Microbz Bio-Live for Women – it’s amazing for levelling hormones and I have most definitely benefitted from taking it daily. This soup is absolutely jam-packed full of beautiful, healing ingredients. Turmeric is an amazing anti-inflammatory and cumin is a natural immune-booster; so essential for the winter months. Keeping our gut flora balanced is paramount for achieving overall good health and well-being. The restorative power of nourishing our bodies with an abundance of fresh foods, herbs and spices is far-reaching and can have an amazing and lasting impact on our health. This recipe will soothe, calm and restore the gut and it just so happens to taste rather divine, too! 1 x small onion, 1 x carrot, 2 x sticks of celery, 1 x squash (chopped and cubed), 1 x sweet potato, 1 x tsp turmeric, 1 x tsp ground cumin, 1 x tsp paprika, cumin seeds, dairy-free yogurt, salt & pepper to taste. • Cube squash, season & roast for 35 minutes. • Finely chop onion, carrot & celery and fry in a little coconut oil (until onion is translucent). • Add squash plus turmeric and cumin to the pan and cover with gluten-free stock. Simmer for 20 minutes. • Cube sweet potato, cover with paprika and roast until crispy. • Blend contents of pan and season. • Top soup with dairy-free yogurt, croutons and a sprinkle of cumin seeds. Hey presto! A delicious bowl of restorative, healing and energy-boosting soup to warm your cockles on a cold, blustery day. 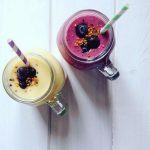 I love a delicious smoothie to start the day and this fantastic duo contain potent and nutrilicious blend of anti-inflammatory, anti-bacterial and health-boosting ingredients. Being quite high in natural sugars, it’s always best to balance smoothies with an element of protein. In the case of all of my delicious blends, I add a handful of almonds, cashews or walnuts. The addition of nuts will lower the GI and decrease the rate at which the sugars from the fruit enter the bloodstream thus avoiding the dreaded sugar spike. Both of these beauties have the same base – frozen banana, nuts, bee pollen and coconut nectar. Simply add to this base: chopped mango, chopped pineapple and the juice of 1 lime to create the ‘Tropical’ version and frozen blueberries and raspberries to create the ‘Belter’. A handful of each fruit is a good amount. Blend until smooth and creamy and serve over ice. Adorn with a few fresh berries and some bee pollen; pastel, paper straws are optional! I am delighted to say that each time I’ve made this dreamy dessert for family and friends, it’s gone down an absolute treat! 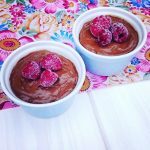 Being free from all the ingredients that typically make-up a sumptuous, luscious chocolate pud, it’s hard to believe that it’s even possible! Well, go grab yourselves the following ingredients and give it a whirl! 2 x ripe avocados, 1 x banana, 4 x tbsp raw cacao powder, 4 x tbsp coconut nectar, 3 x medjooled dates and some water to loosen mixture of necessary. • In a food processor, process together avocados, banana & dates until smooth. • Add all other ingredients until creamy, light and dreamy! • Decant into receptacles of choice and refrigerate for 1 hour. • Top with berries, nuts and/or desiccated coconut. This is one of my all-time favourite ‘sweet treat’ recipes. It’s 100% healthy, bursting with anti-oxidants and it tastes delicious!